I always opposed separating-out things in this way! My words find their form, time, place and that has included words on art gallery walls, curation of works around my texts, curating artist-videos -including my own- seeded by my texts, as well as a more involving collaboration on a film-based installation, etc. Incidentally, the first film I ever made was based on Antonin Artaud’s Artaud Le Momo, using his words visually and aurally. A new project called Porting was set to begin with a word-based visual/performative work early in 2017, but Abu Dhabi intervened to thwart it for a while. Let’s see where my assembling of Porting One (DXB) takes me in 2018?
. Labouring One to Seven (Island of Terror) – Guy Mannes-Abbott – Supercommunity – e-flux journal – Venice Biennale, 2015. Contributions by visual artists, writers & philosophers took this & other forms each day. The Art of Work -links to all the texts above which are downloadable too. Supercommunity for La Biennale 2015 -links to the whole project, since published as a book by Verso Books, Nov. 2017. Numbers 4, 9 and 10 of Inter/Intra. 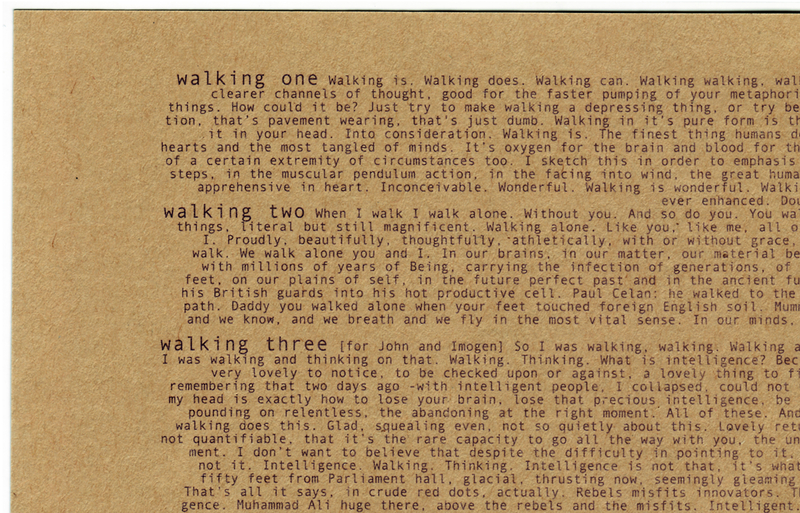 This series of e.thing texts were commissioned for End Note(s), a publication that “extended” the Moderation(s) project produced by Witte de With and Spring Workshop. They respond to and develop on thematics of the very various forms that the project took. The other contributors to this book were; A Constructed World, Nadim Abbas, Defne Ayas, Oscar van den Boogaard, Mimi Brown, Heman Chong, Chris Fitzpatrick, Amira Gad, Travis Jeppesen, Latitudes, Christina Li, Guy Mannes-Abbott, Samuel Saelemakers, and Aaron Schuster. End Note(s) is a fine looking and reading thing, vibrant in green, one of the colour options instead of black above. I didn’t insist on my favoured font and perhaps should have done, but did want the text to be as large and ‘loud’ as possible (these are full page images) because of the subtleties they entrain… That is, what they are saying is the opposite of assertion, right?! You can get a copy of these and the book from WdW’s site here, Cornerhouse, UK, Ideabooks, Amsterdam, Artbook, New York.
. me, we, the, be/coming migrant – Guy Mannes-Abbott – 52 Weeks… – Gulf Labour, 2013.
. in witness time begins – Moderation(s) – Witte de With, Rotterdam, 2013. ‘In witness times begins’ was my contribution to a weekend of performance at Witte de With A Thing at a Time -part of Moderation(s)- over the 19th/20th April 2013, also involving Mette Edvardsen RoseLee Goldberg Anthony Marcellini Eszter Salamon Benjamin Seror and Koki Tanaka. The commission was for a wall-text piece for a new bar in this space leading to the main theatre/lecture hall through the grey door. I focused on performance as such, intervening in taken-for-granted notions of it; time, authenticity, witness, sweet Cagean nothings. I produced four text pieces; Per 1-4, as a pamphlet publication in the rack there and downloadable below, e.thing essays at witness referencing Paule Thevenin’s witness of Antonin Artaud, Hannah Arendt’s witness of Eichmann, mine and Bhupen Khakhar’s witness of state sponsored killings in Baroda 2002 (this text uses no proper nouns, however). Each leads towards this reconceptualising of time and when it is, takes places, begins… again. My warm thanks to Defne, Heman and Samuel.
. The Country of the Blind and Other Stories – CAMP [Shaina Anand, Ashok Sukumaran, Iyesha Geeth Abbas] with Guy Mannes-Abbott, Folkestone Triennial, 2011. CAMP were commissioned to contribute to FT2011 and worked with volunteer coast watchers over several months, enabling them to capture hundreds of clips of their view/s. I was invited to join in the developing of these visual and oral clips/anecdotes into a 60 minute long film/installation which also involved ‘watchers’ in making additional recordings. I work with words; structuring and clarifying, adding depth or dimension, developing dialogue and writing voice. Beyond a mention for my 35-page script lies the secret realm of a very special collaboration.
. walking one to ten – salon 3, London, 2001.
salon 3 [Hans Ulrich Obrist, Maria Lind, Rebecca Gordon Nesbit] invited me to come up with an appropriately scaled project for their modest-space-with-big-ambitions inside the Elephant & Castle shopping centre. 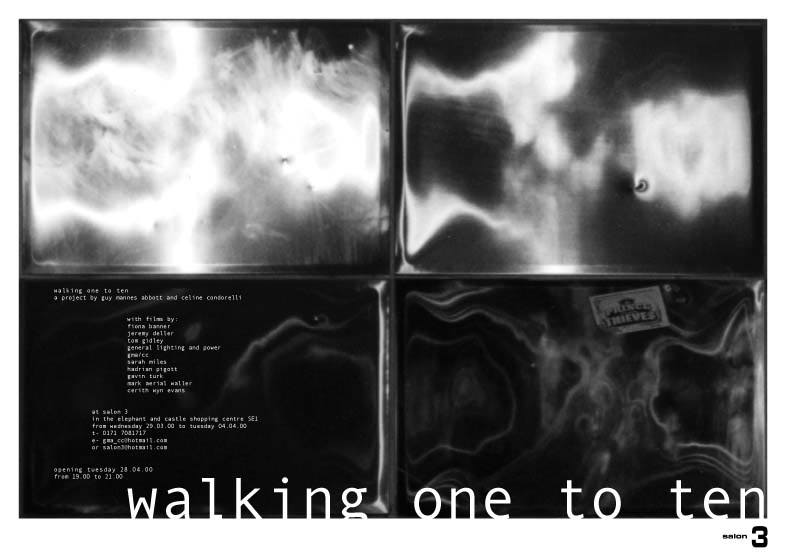 I’d already prepared to use the ten texts of walking 1-10, a sub-series of e.things, to make a series of films called Head in the Clouds at RP in 2000. 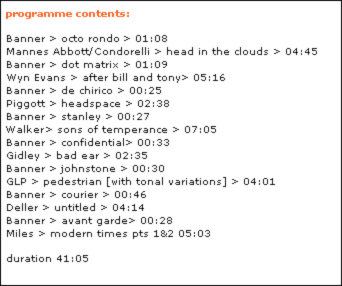 Instead, I used them to ‘seed’ this programme of artist’s videos. The walking (in place and space) involved my actual nocturnal habit of looping between home on Balfour Street and Waterloo Bridge, which detoured around the E&C at that time. So it was peculiarly fitting that the original week-long screening of the programme was at salon 3’s space. Celine Condorelli collaborated in the making of a tenth contribution to w1-10 [screen-grabs below minus my voice over] and with that first realisation. The programme was curated on the basis that the artist’s work had varying peculiar relationships with film-making -including none. This was important because I wanted them to respond to the rhythms and ‘lightness’ of my words rather than ‘film’ the texts. The curating of artists was precise and their brief was to make anything they wanted from a single word to any or all of them or their potentialities. Fiona Banner had by then, for example, painted her worded responses to movies, notably Apocalypse Now in The Nam. Characteristically, she took up the challenge to make her first ever film/s for walking 1-10. Similarly, I knew Jeremy Deller was assembling VHS footage of anti-globalisation protests and preparing a project that became the Orgreave film with Artangel. I remember him asking if he could “have the political one” [walking nine] to work with, before cutting his first film too. Surasi Kusolwong/ Plug-In Buildings [Bangkok-London]/ 1999/ n.a. Guy Mannes-Abbott and Celine Condorelli/ To City / 1999/ n.a. Essential Things celebrated the completion of the first one hundred e.thing texts, which had begun circling themselves; D, for ‘live dangerous’, had become d-plus -similar, but with consequences. I wanted to accompany my texts with existing works of visual art that embodied the spirit of the e.things as a whole. For the most part, these were works that had resonated with me over several years and possessed an independent presence amongst the texts. Together the artworks ‘stood’ as a show without my texts, but the texts articulated continuities and forged together works like Simon Periton’s Anarchy doily, Sarah Lucas’s, for once literally ballsy, Lion Hearts, with Cerith Wyn Evan’s Lacanian ‘loop’, for example. I’d always remembered a sound piece of Angela Bulloch’s, for example, from a show called ‘Broken English’ at London’s Serpentine Gallery, in 1991. That piece was called ‘Crowd Sound Piece’ and involved three separate chairs; yes, no and maybe. Angela made a new bench piece for ‘essential things’, in which she used the old sound track to argue with herself and called it ‘Basically the answer is yes’. None of the art corresponds to any particular one of the texts but it all shares a very specific location with them for me: the domain of the e.things. None of the works is simply or merely what it appears to be -least of all Gary Hume’s Happy ‘sign’ -gloss paint on aluminium- which communicated so intimately with a near-guarantor of tears; richard one- and yet everything in the show was dangerously alive. The show was accompanied by the publication of a CD-ROM of the same texts; then still exotic but soon a banal format. Incidentally, the format of my texts was specific to a book of these 100 texts that the gallery did not deliver before closing in 2000.
. WE GOTTA GET OUTTA THIS PLACE Curated by Stefan Kalmar at Cubitt, London, November 1997.
nothing else worth trying to talk about, except that it, the saying, the saying it is probably impossible. Impossible. Impossible because it inherently can’t be said. Can’t be said, anyway. But even the attempt is ridiculous, because. It would take too long and always be unsatisfactory anyway. And so why am I still going to try to do it? To do it? Anyway. The Buddha knows I can’t, the Buddha knows. The Buddha knows. But he doesn’t know everything, and -maybe ironically, he doesn’t know the e. thing. Now that is ironic. That’s ironic. Ironic. But he does. He does. Because. He says many things. Many things. Of course. But one -and this is the e. thing for the Buddha, is that thing. That thing. About if you do want to see it, the perfect way, he means. The perfect way is what he means, but it could be the e. thing, because. The e. thing because. It could be. But if you want to see it, the perfect way, then have what he calls no fixed thoughts either for it or against it. Stumble on the perfect way, don’t ever try to fix the perfect way, don’t try to articulate the perfect way. Leave the e. thing alone or give up any chance of understanding it. Or knowing it. Or ever seeing it. The e. thing. The perfect way. It’s the same thing and there’s no irony here. No irony here. None, because. But if you look you will not find. If I tell you. If I could tell you. If there were words for it. If it could be heard then you’re already lost. If you need to hear. Need to hear? If you need to hear then you can’t understand. The e. thing exceeds that need to hear. Need to hear. If you need to hear then I must not tell you. If you need me to tell you you can’t hear it. Telling you will not make you hear. Listen and you won’t hear. Listen. You will not hear. The essential thing about the essential thing. The essential thing about the essential thing is that it can’t be taught. Taught. It can’t be taught, it can’t be heard, it can’t be told, it can’t be described, conveyed, elucidated upon, purchased, read to, or dictated. It can’t be declaimed, shouted, declared, it can’t be introduced into your bill of rights, your right of way. Your Bill of Rights? Oh you’ve missed it. Already. Missed missed missed it. You take your right of way and leave me the e. thing. Leave me the e. thing. The e. thing. Leave me to it. Then. The e. thing then is not to look, not to ask, not to search actually. Not to search. Actually. Even though it is a product of striving, a product of striving. A striving. It is. A striving. Only. Always. The essential thing is an invisible striving. Perpetual. Perpetual striving for the e. thing, is the essential thing. The e.thing. The essential thing is a perpetual invisible open ended striving.